So you’re looking to get inked. Whether it’s your very first tattoo or you already have a full sleeve and a mural decorating your back, finding the right place to get your tattoo done is essential. The talented artists of Maryland have you covered. From cool shops in Baltimore to retro spots in Ocean City, here are the 10 best tattoo parlors in the state! DeVille Ink in Baltimore, Maryland is a family owned and operated parlor specializing in piercing, tattoos, and aftercare. They’ve been featured in many television shows, newspaper articles, and magazines. Do yourself a favor: Check out their artist gallery, whether you’re in the market for a new tattoo or not. The work is simply sublime. Open Monday—Saturday, Lady Bird Tattoo is one of Annapolis’s best tattoo parlors. They work almost exclusively by appointment and pride themselves on “offering high quality tattoos with great customer service.” Lady Bird often brings in “guest artists” to give their customers even more options to choose from. Lethal Injections Tattoos and Body Piercings in Cambridge comes highly recommended. They specialized in cover-ups, in addition to original work. If you’re a dog person, you may appreciate their emphasis on helping Hill Hound Rescue. Dimensions Piercing and Retro Boutique is known as “the oldest, cleanest and most trusted body piercing shop in Ocean City.” In addition to piercing and tattooing, they sell skate gear, clothing, and accessories. Check them out if you’re near the boardwalk. Tattoo-Icons Art Gallery is central between Baltimore and Philadelphia “with elite artists to fill every desired style and quality of tattoos and piercings.” With five artists, each with their own style, you’re sure to find something to love. They recommend you book an appointment online. Currently, they have a special: You can get any of the 151 original Pokémon for only $100 a piece. Independent Ink in Frostburg, Maryland offers “work in a broad range of styles from old school, traditional, fine-line, Japanese, realism, to Americana.” Their facility is inspected annually to make sure they’re staying up to the best health standards. Make sure to call in for an appointment. 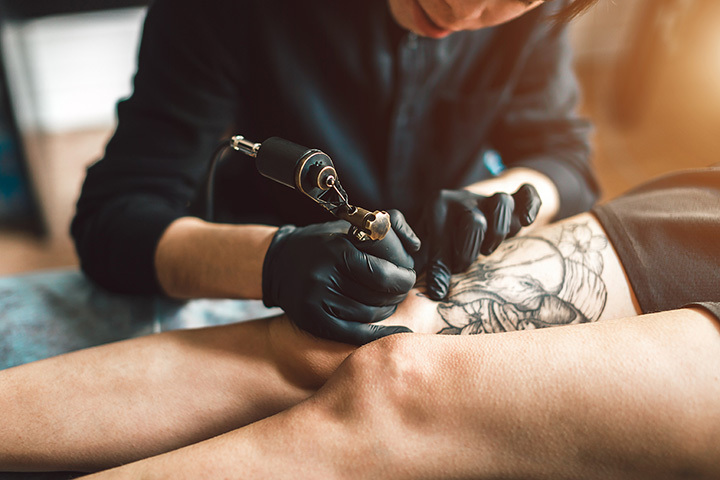 Oxblood Ink is Severna Park’s “first and only tattoo studio” offering “custom quality tattoos in a comfortable sterile environment.” They have three excellent artists on staff, each with their own office for customers to have privacy while they plan out their pieces. Keep in mind they’re closed Sunday and Monday. One Shot Studio in Edgewater, Maryland offers tattoos and piercings. They’re happy to look at designs of your own or provide something from their portfolio. Of course, they can also create something new for you. Red Octopus Tattoo has multiple locations throughout Maryland with one in Morningside, Landover Hills, Crofton, and Prince Frederick. They offer a 10 percent discount for military at all of their locations and take walk-ins. They’ve got a huge roster of incredible artists to choose from, a benefit of having such a large outfit. Black Lotus Tattoos’ philosophy is that “it’s not just a tattoo, it’s a work of art.” That’s the kind of thinking you want in an artist; their work will mark you for the rest of your life, after all. Consider their microblading and piercing options, too.